Do squirrels eat smaller animal such as Mice, Rats or Birds? Feeding birds is a fun, relaxing activity. But you want to feed the birds – not the squirrels. If neighborhood squirrels are invading your bird feeders and eating all the birdseed, we can help. 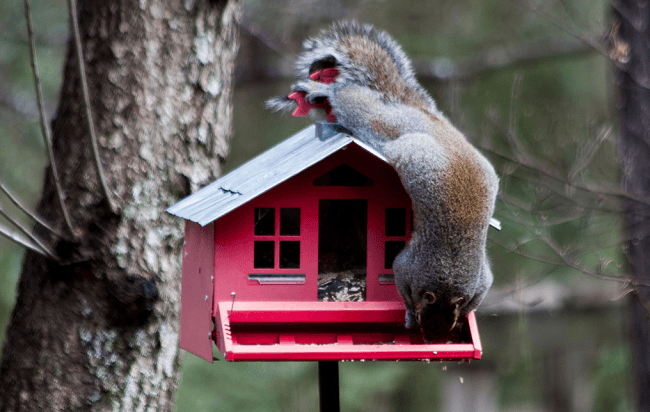 We’ve found our top three favorite squirrel proof bird feeders. 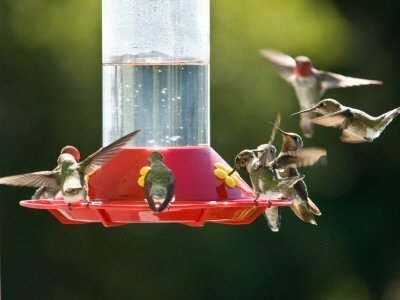 One of the most important features of Humming bird feeders are that they are easy to clean and fill. You don’t want feeders that are tricky to disassemble and clean as over time, food will get stuck into the cracks and crevices which will tarnish its functionality and durability. The feeder should be east to rinse in order to wipe the residue nectar away and prevent it becoming a breeding ground for bacteria. Hummingbirds are really attracted to the color red and it always attracts their attention. The whole feeder does not have to be red, only a small portion of it. Contrastingly, you should avoid feeders that have the color yellow as this will attract wasps and bees. They are competitive animals and will do their best to keep birds away from the feeder. If you don’t know what size feeder you need, start small and gauge your demand from there. Nectar can spoil quickly if it hasn’t been drunk for a few days so you don’t want to have a large feeder that wastes food. Outlined below are two of the best choices of humming bird feeders that are currently on the market. The best hummingbird feeder on the market is the First Nature 3055 32-ounce Hummingbird Feeder. It is a bright red color that will easily gain the attention of any hummingbirds and attract them to your garden. It is extremely easy to fill thanks to the mouth jar reservoirs that are extra wide. The product can be easily disassembled and is very straightforward and simple to clean and fill. It is a plastic based product which means that it won’t be easily broken and is not as heavy as other materials. Several hummingbirds can use the feeding ports at any moment in time. You don’t have to worry about mixing the nectar solution elsewhere as the proportions can be correctly mixed in the feeder jar itself, meaning less mess and hassle for you. There is a handy hook on the top which allows you to hang the product from any suitable place. Many of the products on the market today are difficult and time consuming to clean. That is not the case with this product, it is very easy to clean and clean it thoroughly at that. As it is made up of three simple parts, it is very easy to dismantle and reassemble. There is no need to use a funnel to fill it as the opening is extremely wide, reducing the amount of spills and mess. If you are looking for a hummingbird feeder that is low maintenance and attracts plenty of hummingbirds, this is the feeder for you. There are some durability concerns with the plastic when the feeder is used in more testing conditions. The components may disassemble and come apart if not tightly screwed together if they are regularly exposed to high winds. Perky-Pet 136TF Perky’s Finest Yellow Flower Top Fill Plastic Hummingbird Feeder is the second best choice when it comes to hummingbird feeders. The 16 ounce capacity gives you a nice balance of space that will keep the hummingbirds satisfied while not needing to be refilled very often. The wide mouth top means that it is extremely easy to fill and the feeder has a nice design as a whole. It is an interesting, ornamental shape and is certainly one of the more physically attractive models on the market. The lid even has a built in ant moat which keeps the pesky insects away from the sugary nectar. The plastic material makes the feeder lighter and is perfect for a low wind area. The wide opening allows you to easily fill the feeder with nectar without and sticky spills or drips. Everything is very well contained which give sit a smart function and appearance. The feeding tubes are decorated with four flowers and the red color makes it very attractive to hummingbirds. The ant moat prevents one of the most common problems when using nectar as feed. If you live in a windy environment, this is not the feeder for you. Due to its plastic material, it is lightweight and will not stand the barrage of high winds. This will result in spills and a shorter life of the product. If it is not tightly assembled, it will be prone to leaks at the bottom of the fixture.